After they’re flash frozen, Appli-Tec stores PMF materials at correct temperatures to ensure maximum shelf-life retention. Pre-mixed and frozen (PMF) adhesives started with Hughes Electronics Defense Division post WWII. One of the first applications used polysulfide-based materials related to aircraft fuel systems. PMF adhesives became a commercial product in the early 1960s. Since then, PMF adhesives have gained wide acceptance. Today, industry leaders in market sectors such as Aerospace and Defense, use PMF adhesives for high reliability electronic and aerospace applications. 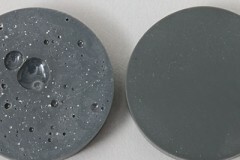 PMF formulations are used in a variety of applications, ranging from automated bonding processes, staking of materials for secondary assembly processes, high shear strength bonding, hermetic encapsulation, thermal management, electrical and/or thermal conductivity or isolation, and many others. As electronics and packaging engineers continue to develop ever-more densely packaged electronic assemblies, the need for highly engineered adhesives, encapsulants and coatings becomes critical to the function of the finished assemblies. These highly engineered formulations are often custom-developed materials that consist of two, three or more discrete chemical materials that must be precisely measured, processed, blended, and packaged prior to use. Precision-mixed and frozen materials offer manufacturers a reliable source of “known-good” materials that can be sourced and cryogenically stored and dispensed for a year or more. 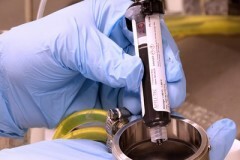 A variety of materials and chemistries can be provided in a precision mixed and frozen format, ranging from simple mixing, packaging and cryogenic processing of widely used industry standard materials (e.g., 3M 2216 epoxy), to custom-formulated, application-specific materials engineered for an exact application or a specific range of properties. Between those two extremes lies a wide range of modified or semi-custom materials that offer modest alterations to well-known, commonly used materials. 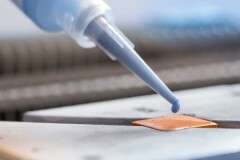 Appli-Tec’s precision mixed and frozen (PMF) adhesives guarantee consistent results. 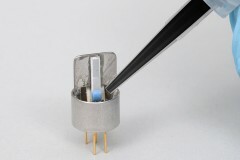 Appli-Tec's thermally conductive adhesives dissipate the very high heat generated by microelectronic components. A medical device manufacturer eliminated in-house mixing by purchasing PMF adhesives from Appli-Tec.